Based in Hobart, The Mercury is Tasmania’s largest circulating daily newspaper. The Sunday edition of The Mercury is called The Sunday Tasmanian. Based in Launceston, The Examiner is Tasmania’s oldest newspaper and publishing business (est. 1842). Local news covering Devonport, Burnie, Deloraine, Marawah, King Island and Wynyard. 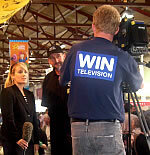 Channel 9 local news crew at work in Tasmania. Australia’s largest privately-owned regional television network, with a substantial presence in Tasmania. An Australian media company, Southern Cross Television has program affiliations with both the Seven and Ten networks, enabling it to develop a mix for local markets, including Tasmania. Richly illustrated with superb photographs, the Tasmania 40°South magazine presents the wilderness, wildlife, culture, industry, landscapes and people of Tasmania. The Mercury, published in Hobart, is the largest circulating daily newspaper in Tasmania.